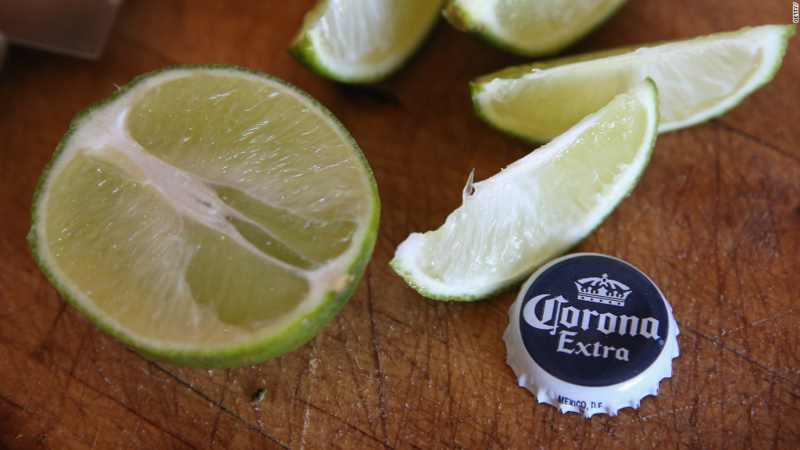 Cinco de Mayo is still four months away, but the company that sells Corona and Modelo in the United States already has a reason to celebrate. Constellation Brands (STZ), which also owns the Robert Mondavi brand of wine, SVEDKA vodka and Black Velvet Canadian Whisky, reported earnings and sales Thursday morning that easily topped analysts' forecasts. The company also issued a healthy outlook for the year that was also better than what Wall Street was expecting. Shares rose 5% to an all-time high. The stock is up 10% so far in 2015. It rallied earlier this week after Goldman Sachs upgraded it to a buy. But beer is the true star (pun intended) for Constellation. Sales were up 16% from a year ago. CEO Rob Sands said in the earnings release that the strong beer results were the main reason why the company boosted its profit outlook. Constellation acquired the full distribution rights to Corona and Modelo from Anheuser-Busch InBev (BUD) in 2013. It has turned out to be a great deal for the company so far. Shares of Constellation are up about 185% in the past two years, easily topping the performance of BUD and other beer rivals Molson Coors (TAP) and Sam Adams owner Boston Beer (SAM) as well as spirits makers Diageo (DEO) and Brown-Forman (BFB). And the company is making it clear that it sees beer as the future. Constellation formed a joint venture last year with glass container company Owens-Illinois (OI) to purchase an Anheuser-Busch InBev glass plant in Mexico that is near Constellation's brewery. Sands has said this will give Constellation more control over a key component it needs for the beer business. Focusing on beer seems to be a smart move. The rest of Constellation's business is not doing as well. Sales of wine and spirits were flat in the most recent quarter. But there could be one problem for Constellation going forward. It's become a momentum stock darling ... with a price to match. Shares trade for more than 25 times earnings estimates for this year. That's a big premium to nearly all of its top competitors. Still, as long as Corona and Modelo sales keep climbing, Constellation may be able to live up to Wall Street's frothy expectations.